Stay in one of 57 guestrooms featuring flat-screen televisions. Rooms have private balconies. Complimentary wireless Internet access keeps you connected, and cable programming is available for your entertainment. Bathrooms have showers and hair dryers. Ideal location: motorway access, free parking, and bus station - Modern renovations completed in 2005 - Culinary highlights 364 days of the year. 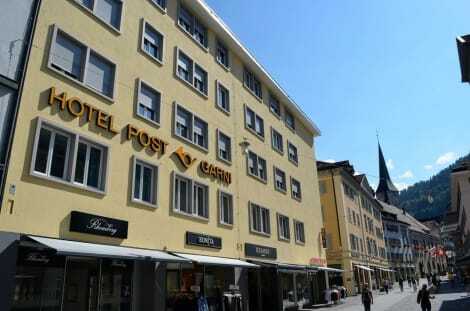 This lovely hotel is situated in Chur. The premises count with 60 welcoming bedrooms. Pets are not allowed at this hotel. The lobby is small with a few comfortable leather seats. lastminute.com has a fantastic range of hotels in Chur, with everything from cheap hotels to luxurious five star accommodation available. We like to live up to our last minute name so remember you can book any one of our excellent Chur hotels up until midnight and stay the same night.